OBJECTIVE To investigate the relationship between clinic provision, consultant and nursing caseload, and processes and outcomes of diabetes care in children. DESIGN Retrospective audit in the South Western region of England of 801 children and young people with diabetes; 701 were seen in a designated clinic. Seven of 21 consultants fulfilled the British Paediatric Association (BPA) criteria for a specialist in childhood diabetes. Seventeen nurses provided specialist care. MAIN OUTCOME MEASURES Glycated haemoglobin, admissions to hospital clinic attendance rates, contacts with a dietitian, measurements of height and weight, and screening rates for hypertension, microalbuminuria, and retinopathy. RESULTS Children under the care of ‘non-specialists’ had higher admission rates to hospital with all diabetes related problems and for hypoglycaemia and lower screening rates for microalbuminuria than those under ‘specialists’. Children under the care of the two tertiary hospital consultants had lowest glycated haemoglobin results, spent least time in hospital at diagnosis, were most likely to have their heights and weights plotted, and to be screened for microalbuminuria and retinopathy, had higher admission rates, lower clinic attendance rates, and fewer dietitian consultations. Higher nursing caseloads were associated with longer periods of admission at diagnosis, better clinic attendance rates, reduced rates of admission after diagnosis, and less likelihood of having blood pressure measured and being screened for microalbuminuria. Children attending general paediatric clinics were less likely to be seen by a dietitian and to have their height and weight plotted. CONCLUSIONS The results are consistent with the recommendation of a BPA working party in 1990 that children with diabetes should be cared for by specialist paediatricians with a caseload of more than 40 children, and that children should be seen in a designated diabetic clinic. Recommendations for good practice in the organisation of diabetic services for children have been published.1 2These include a caseload of more than 40 children, and that they should be seen in designated diabetic clinics.1 However, there is currently little evidence that these recommendations would actually result in improved diabetes care. One study showed improved diabetic control in a district general hospital clinic after the establishment of a single specialist diabetic clinic combining patients originally cared for by five clinicians, using children as their own historical controls.3 A second study compared 88 children attending a specialist diabetic clinic in a tertiary unit with the same number of children seen in general paediatric clinics in district hospitals: significantly lower levels of glycated haemoglobin and reduced hospital stays were seen in the specialist service.4 However, the number of children and clinicians involved were small and no attempt was made to adjust for potentially confounding factors. We report the results of a regional audit in which a number of outcomes such as glycaemic control, rates of admission to hospital, and standards of good clinical practice were examined in relation to consultant and nursing caseload and whether the child was seen in a designated diabetic clinic, taking into account a number of potentially confounding variables. The subjects were all children and young people with diabetes mellitus who were under the care of a paediatrician and who were resident in the South Western region of England during all or part of 1994. Details of the audit were agreed in advance by the paediatricians, diabetes nurses, and other professionals within the region caring for children with diabetes. All consultant paediatricians in the region supplied a list of patients under their care with diabetes. Members of the diabetes team, assisted by audit clerks, completed a questionnaire for each child; each consultant paediatrician and diabetes nurse, and each laboratory providing glycated haemoglobin or fructosamine tests, completed questionnaires about the services they offered in 1994. Each consultant was defined as being ‘specialist’ or ‘non-specialist’, according to the British Paediatric Association criteria.1 In this study all specialist paediatricians had at least 40 children with diabetes under their care and fulfilled at least one of the other two criteria: being a specialist diabetologist/endocrinologist or having a major interest in diabetes and/or seeing children in a designated paediatric diabetic clinic. For each centre the nursing caseload was calculated from the number of children with diabetes and the number of whole time equivalent nurses available to care for children with diabetes. (1) The results of up to four equally spaced glycated haemoglobin tests per child, expressed as multiples of the mean reference value. (2) The proportion of appointments kept, as a proportion of the number of planned visits. (3) The number of admissions to hospital for diabetic ketoacidosis, hypoglycaemia, and stabilisation (excluding time of diagnosis) during the year. (4) The number of nights in hospital due to diabetes related illness (excluding diagnosis). (5) The length of the initial admission to hospital at the time of diagnosis for all children diagnosed in 1994. (1) The proportion of clinic attendances at which the child was seen by a dietitian. (2) The number of recorded (and plotted) height and weight measurements per clinic attendance. A number of potentially confounding variables were considered, including age, duration of diabetes, whether a parent has diabetes, whether living with both parents, Townsend deprivation index,6 insulin dose, and number of injections per day. Confounding variables for children in the three consultant groups were compared initially using the Kruskal-Wallis or χ2tests as appropriate. 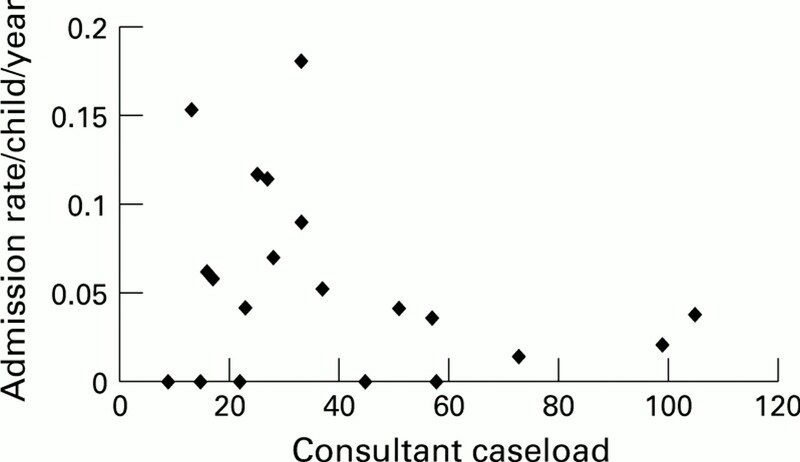 Regression models were used to investigate which confounding factors were related independently to each outcome, and then to compare consultant groups, clinic types, and each centre’s nursing caseload by using a further model adjusting for significant confounders, using the likelihood ratio test. Initially the ratios were analysed ‘result-wise’ using parametric methods and multiple linear regression. Up to four results were available per child, and further analysis using ML38confirmed the need to take into account variation between children as well as between results obtained from the same child. Only the latter are reported, although the results were very similar to those obtained using linear regression. To compare proportions of clinic appointments kept, and proportions of clinic visits in which heights or weights were measured or plotted, EGRET9 was used to fit binomial logistic models which take into account the fact that the denominator varies from child to child. The probability of keeping an appointment was then modelled by covariates, such as age, and was assumed to be the same for all children of the same covariate status. Another level of complexity was introduced by allowing for a variation between children even when their covariate status was the same (random effects models). This approach was used in a few instances to confirm that the results were unchanged. Analysis of the numbers of heights recorded or plotted was restricted to boys less than 18 years and girls less than 16 (n=665), ages by which it might be assumed they had reached their final adult height. When comparing the number of admissions to hospital, differing lengths of follow up were taken into account by using Poisson models, again using EGRET. The rate of admissions (number/unit time) was assumed to be the same for all children with the same covariate status, and hospital admissions were assumed independent. A different approach was also used whereby only the children who had a complete 12 month follow up were analysed as to whether or not they had been admitted at all (n=677). Logistic regression was used. Results of both approaches are reported. The total number of nights in hospital for diagnosis was normally distributed, allowing analysis by multiple linear regression. Separate logistic models were used for the probability of the child having a blood pressure recorded, a test for microalbuminuria, and a retinal examination in the 12 month period. Six children were excluded as they had just moved to the area and did not have a complete 12 month follow up. Information from 801 of 810 children and young people with childhood onset diabetes identified in the audit was used in a multiple regression model with potential confounding factors. There were two specialist paediatricians in the tertiary referral centre (caring for 177 children) and a further five in district general hospitals (caring for 309 children). There were 14 non-specialist paediatricians caring for a total of 315 children, each having a caseload of less than 40 children. Table 1 shows the confounding variables which differed significantly between the three consultant groups. All but one centre had a specialist diabetes nurse available for children. There were a total of 17 nurses (7.4 whole time equivalents) providing care for children in the study, with an average caseload per whole time equivalent of 129 patients. In all but two centres the nurse’s caseload was greater than the recommended5 range of a maximum of 70 to 100 children per whole time equivalent. Fifteen (88%) of these nurses had completed an English National Board 928 (diabetic nursing) course but only six held the registered sick children’s nurse qualification. Of those centres with a specialist diabetes nurse, all provided home and school visits. Out of hours telephone advice was available in all but one centre, provided by a number of different professionals including children’s ward staff, consultant paediatricians, middle grade medical staff as well as the diabetes nurse in eight centres. The proportion of children seen in a general paediatric clinic was significantly related to the caseload of the consultant paediatrician. Only 4.5% (22/488) of children under a specialist paediatrician were seen in a general paediatric clinic. In contrast, 24.8% (78/315) of children under a non-specialist paediatrician were seen in a general paediatric clinic (χ2 p<0.001). A total of 885 HbA1 results were available from eight centres, involving six different test methods. Glycaemic control was significantly related to consultant group (p<0.001) (see table 2). The difference remained significant (p<0.001) after adjustment for significant confounders with mean results for non-specialists 8% higher than for tertiary specialists (p<0.001). There was no significant relationship with the type of clinic attended or nursing caseload. The overall probability of any clinic appointment being kept was 82.2%. Both non-specialist and tertiary specialist clinic attendance rates were lower than for district hospital specialists (see table 2) (adjusted odds ratios (95% confidence interval, CI) 0.52 (0.41 to 0.67) and 0.27 (0.21 to 0.35) respectively). The probability of attending clinic appointments was significantly lower in children cared for by nurses with smaller caseloads after adjustment for other potentially confounding variables (p<0.001). There was no significant relationship with type of clinic attended. Altogether 4.1% of 677 children with a complete 12 month follow up had at least one hospital admission in 1994. Children under the care of district hospital specialists were least likely to have been admitted (table 2). Compared with these children, adjusted odds ratios (95% CI) for admission for those under non-specialists and tertiary specialists were 7.61 (2.12 to 27.29) and 4.10 (0.84 to 19.99) respectively. The mean admission rate with hypoglycaemia was 0.05 admissions per child per year (n =794) (for rates by consultant see fig1). The lowest rate was for children under district hospital specialists (table 2). After adjustment, the mean admission rate for children under non-specialists was five times that of the specialist group (95% CI 1.9 to 13.3). There was no significant association with nursing caseload or type of clinic attended. Altogether 7.1% of 675 children with complete 12 month follow up had at least one admission in 1994. The mean rate was 0.11 admissions per child per year (n=792). There was no significant difference between the three consultant groups after adjustment for confounding variables (see table 2). Admission rates were not related to nursing caseload after adjustment for potentially confounding variables. There was no significant association with type of clinic attended. Of the 674 children with complete 12 month follow up, 9.8% had an admission for any diabetes related reason (apart from admission at the time of diagnosis) in 1994. The mean admission rate was 0.15 admissions per child per year (n=791) (for rates by consultant see fig 2). Admission rates were lowest for children under the care of district hospital specialists (table 2). After adjustment, rates for those under the care of non-specialists and tertiary specialists were higher by factors of 2.9 (95% CI 1.7 to 4.9) and 2.7 (95% CI 1.4 to 5.1) respectively. Hospital admission rate was significantly higher in children cared for by nurses with a lower caseload (p=0.006). This was still significant after adjustment for significant confounding variables (p<0.05). There was no significant association with type of clinic attended. Admission rate with all diabetes related problems (diabetic ketoacidosis, hypoglycaemia, and for stabilisation). Ninety nine children spent an average of 4.6 nights in hospital at diagnosis. There was a significant difference between means for the three consultant groups (p<0.001 by one way analysis of variance, as there were no significant confounders) (see table 2). The tertiary group was significantly different from both other groups (Scheffe test at 5% level). 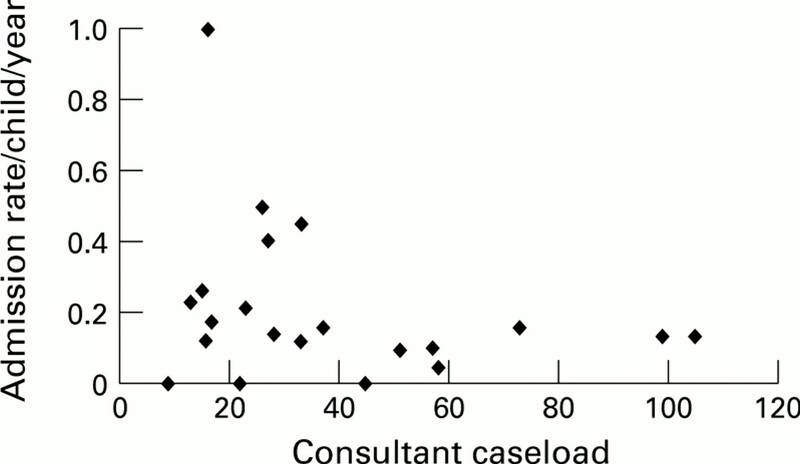 There was a weak positive correlation between nights spent in hospital and nursing caseload (r=0.22; p< 0.05). The overall probability that a clinic visit involved a consultation with a dietitian was 31.5%. Consultations were most likely for children under the care of district hospital specialists (see table 2). Relative to this group, adjusted odds ratios (95% CI) for non-specialists and tertiary specialists were 0.40 (0.33 to 0.49) and 0.11 (0.08 to 0.17) respectively. The probability that a clinic visit involved seeing a dietitian was 6.3% for those attending a general paediatric clinic compared with 35.7% for those attending a designated diabetic clinic. This association remained significant (p<0.001) when adjusted for other variables. The adjusted odds ratio for the child being seen by a dietitian for designated diabetic clinics compared with general paediatric clinics was 7.30 (95% CI 4.67 to 11.40). This association remained significant once adjusted for consultant group (p<0.001). The overall probability that height was measured at a clinic visit was 91.6%, with no significant association with type of consultant (table 2), nursing caseload or type of clinic attended. The overall probability that the height measurement was plotted on a centile chart at a clinic visit was 60.9%. Children under the care of tertiary specialists were most likely to have their heights plotted (see table 2). The adjusted odds ratio (95% CI) for this group compared with district hospital specialists was 2.50 (1.85 to 3.37). Height was less likely to be plotted in children cared for by nurses with a smaller caseload (p<0.001). Altogether 52.4% of attendances at a general paediatric clinic resulted in height being plotted compared with 62.5% in a designated diabetic clinic. This association remained significant after adjustment for other variables (p<0.001, n=516). The adjusted odds ratio for the group seen in a designated diabetic clinic compared with the group seen in a general paediatric clinic was 1. 64 (95% CI 1.30 to 2.07). This association remained significant after further adjustment for consultant group p=0.001; odds ratio 1.52 (95% CI 1.19 to 1.96). The overall probability that weight was measured at a clinic visit was 92.8%, with no significant association with type of consultant (table 2). The overall probability that weight was plotted on a centile chart at a clinic visit was 61.3%. Children under the care of tertiary specialists were most likely to have their weights plotted (see table2). The adjusted odds ratio (95% CI) for this group compared with the district hospital specialists was 1.95 (1.50 to 2.55). Weight was less likely to be plotted in children cared for by nurses with a smaller caseload (p<0.001). Altogether 56.4% of children attending a general paediatric clinic had their weight plotted compared with 62.1% of those attending a designated diabetic clinic (p<0.05). This difference remained significant after adjustment for other variables (p=0.008, n=618). The odds ratio for the group seen in a designated diabetic clinic compared with the group seen in a general paediatric clinic was 1.38 (95% CI 1.09 to 1.74). This association disappeared once adjusted for consultant group. Of the 201 children over the age of 12 years and with diabetes for more than five years, 74.5% had blood pressure recorded over the 12 month period. There was no significant difference between consultant groups after adjustment for confounding variables (table 2). Eighty two per cent of children cared for by a nurse with a caseload of less than 200 were recorded as having their blood pressure measured compared with 48% of those cared for by a nurse with a larger caseload (p<0.001). This difference persisted after adjustment for other variables. The odds ratio of blood pressure measurement for those with a caseload of 200 or more compared with those with a smaller caseload was 0.23 (95% CI 0.11 to 0.48). There was no significant association with type of clinic attended. Altogether 44.0% of 200 children had a test for microalbuminuria over the 12 month period. Compared with children under district specialists, those under non-specialists were screened for microalbuminuria less frequently (adjusted odds ratio 0.38, 95% CI 0.15 to 0.97), and those under tertiary specialists more frequently (adjusted odds ratio 3.02, 95% CI 1.18 to 7.74) (see table 2). Fifty five per cent of children cared for by a nurse with a caseload of less than 200 were recorded as being screened for microalbuminuria compared with 2% of those cared for by a nurse with a larger caseload (p<0.001). This difference persisted after adjustment for other variables. The adjusted odds ratio of microalbuminuria screening in those with a caseload of 200 or more compared with those with a smaller caseload was 0.03 (95% CI 0.003 to 0.19). There was no significant association with type of clinic attended once adjustment had been made for consultant group. Altogether 55.2% of 201 children had a retinal examination over the 12 month period. The proportion of children having a retinal examination differed significantly between consultant groups (p=0.035) (see table 2). There was no significant association with nursing caseload and type of clinic attended. The use of multiples of the mean to overcome differences in test method for glycated haemoglobin has been proposed,11 12 but this remains a potential source of bias. Further research is needed to examine the validity of using multiples of the mean for comparative audit. Notwithstanding these laboratory problems, the overall difference between the highest and lowest consultant groups is considerable, representing a difference in glycated haemoglobin of the order of 1%. The diabetes control and complications trial did not find a threshold for diabetes control below which the risk of complications disappears.13 Therefore an improvement in overall control of the magnitude found in this study would be clinically important if maintained in the long term. Children under the care of the two tertiary hospital consultants appeared to have significantly lower glycated haemoglobin results. This occurred despite a higher median age and longer duration of diabetes in children under their care (table 1), both of which would be expected to be associated with worse control. The laboratory providing glycated haemoglobin results for the tertiary unit was also used by several other centres in the region, but the possibility that differences in test method were responsible for this finding cannot be excluded. Although the audit suggests some additional benefits from care by tertiary specialists, there were some aspects of care, as suggested by lower clinic attendance rates, higher admission rates and the lack of dietetic advice that appeared less satisfactory than that delivered by district hospital specialists. The reasons for the lower clinic attendance rates are unclear, and it should not be assumed that they indicate a less acceptable service. Nor is it clear whether the higher admission rates and lower glycated haemoglobin results are related. However, tighter diabetic control might have accounted for the more frequent admissions with hypoglycaemia than was seen with children under the care of district specialists. As there were only two tertiary specialists in a single centre it is not possible to draw general conclusions about tertiary consultants with any degree of confidence. It would in any case be impractical for all children to be managed by tertiary specialists in diabetes in such a geographically large region. This study should not therefore be used as evidence that it would be desirable for children to be cared for by tertiary specialists. Readmission rates to hospital compared favourably with those reported from Edinburgh in 198914 : children in the current audit spent fewer nights in hospital with diabetes related problems than children attending the specialist diabetic clinic in the Edinburgh study (0.56 v 1.2 nights per year), with fewer children admitted with hypoglycaemia (4.1% v 16% respectively). It was perhaps surprising that nursing caseload appeared to have little association with many outcomes given the fact that the introduction of the specialist diabetes nurse has been seen by many, if not all, clinicians as a major advance in diabetes care provision. This might simply reflect that nearly all specialist nurses in the region were over stretched with only two having a caseload within the 70 to 100 children per whole time equivalent recommended.5Furthermore, there was no provision in this audit to assess any variation in the quality of advice and support provided in the community which might be an important variable predicting diabetes care outcome. However, this study did identify that very high nursing caseloads were associated with fewer children being screened for hypertension and microalbuminuria. The apparently paradoxical finding that children were less likely to attend consultant clinic appointments when nursing caseloads were lower may reflect the better opportunities a smaller caseload allows for community based contact thereby reducing reliance on intermittent hospital attendances. Improved access in the community might also explain the shorter periods spent in hospital at diagnosis by children from centres with a better caseload ratio. The increased rate of hospital admissions with poor control in those centres with smaller nursing caseloads is very difficult to explain. It was not surprising that children attending general paediatric clinics were less likely to see a dietitian. The main purpose of holding diabetic clinics is to facilitate the multi-disciplinary approach to diabetes management. Children were also less likely to have their height and weight plotted if they attended a general paediatric clinic. The differences in casemix between different consultants, all of which had a significant association with some of the measures of process and outcome used, underlines the importance of controlling for these factors when making comparisons of consultant activity. In one instance, significant differences in admission rates with ketoacidosis and for stabilisation between consultant groups disappeared when adjusted for confounding variables. In any observational study such as this, the associations found do not necessarily imply a causal relationship; it is possible that other, untested factors may be responsible for the observed differences. Further evidence could come from observing improved outcomes following the institution of recommended consultant caseloads. In conclusion, children with diabetes under the care of clinicians with a larger caseload appear, by the criteria of this study, to have a better clinical outcome than those seen by non-specialists. Although the commitment of all those caring for diabetic children was clear and the overall standards of care relatively high, the associations found in this study support the national recommendation1 that consultants providing care for children with diabetes should have a caseload of more than 40 children, and that children should be seen in a designated diabetic clinic. We wish to acknowledge the cooperation and contribution of the paediatricians (SR Ackroyd, JD Baum, NH Bluett, ARJ Bosley, J Broomhall, DN Challacombe, TL Chambers, TJ French, NJ Gilbertson, NJ Hunter, DL Kennaird, AW McNinch, TM Nicole, RCL’E Orme, TGM Perham, DCL Savage, GP Taylor, JH Tripp, MH Webster, MAW Wooldridge) and diabetes nurses in the South Western region of England without whose help the audit could not have taken place. Source of funding: regional audit department for nurse coordinator’s salary. (1990) The organisation of services for children with diabetes in the United Kingdom. Diabetic Med 7:457–464. (1991) What professional supervision should children with diabetes and their families expect? (BDA, London). (1988) Improved diabetic control in a district general hospital clinic. Arch Dis Child 63:180–185. (1990) Is a specialist paediatric diabetic clinic better? Arch Dis Child 65:139–140. (1996) The principles of good practice for the care of young people with diabetes. (British Diabetic Association, London). (1994) Widening inequality of health in northern England, 1981-91. BMJ 308:1125–1128. (1994) Authors’ reply to letter to the editor. BMJ 310:741. (1991) ML3 version 2.201. Multilevel models project. (Institute of Education, University of London, London). (1993) EGRET reference manual, revision 4. (EGRET, Seattle). (1987) Intellectual deficits associated with early onset insulin dependent diabetes in children. Diabetes Care 10:510–515. (1992) Outcome measures for child health. (BPA, November, London). (1995) Like should be compared with like. BMJ 310:740–741. One of the attractions of paediatrics as a specialty was that one could still practice as a generalist rather than only as a subspecialist as in the case of adult medicine. The subject, however, evolves and as our understanding of disease processes increases in complexity, subspecialisation becomes a ‘necessary evil’ if the children in our care are to receive optimal management. Dr Baumer and his coauthors present the results of an audit of the year 1994 for the management of childhood diabetes in the South Western region of England. It presents its data with reference to recently published guidelines for the management of children with diabetes and broadly divides clinics into: (1) tertiary referral clinics; (2) specialist paediatricians running diabetes clinics of greater than 40 children in district general hospitals; (3) general paediatricians with caseloads of less than 40 children with diabetes, a quarter of whom were seen in general paediatric clinics. The Diabetes Control and Complications Trial Research Group have focused on the importance of optimal glycaemic control throughout the duration of diabetes.13 This has placed the onus on purchaser and providing clinician alike to look to ways of providing a service for these children and their families that is most likely to enable the achievement of that optimal control and a method for the early detection of diabetes related complications. Anyone who has looked after this all pervasive condition, however, will know that there is more to its management than adjustment of insulin regimen and measurement of capillary blood glucose and glycated haemoglobin. Other factors such as ‘food intake and lifestyle’ will have a much greater impact on glycaemic control until we have a more physiological method of insulin replacement therapy. There is little doubt that there should be a team approach to management of these children and the ideal membership of that team is well documented.1 2 5 There is also little doubt that the team will function most efficiently, and the families benefit from being seen, in clinics dedicated to children with diabetes. A minimum caseload will be necessary to ensure adequate experience for the team and its cost effective function. Difficult and important questions are raised by this paper. Children who live a long way from such specialist clinics are clearly faced with transport difficulties and when acute problems arise should they always be transferred to the specialist centre or be cared for by the local team who will have been deskilled by lack of contact and experience? What is more important, being seen by the same people at each visit who get to know the child and family and its difficulties or being seen in a specialist centre by a succession of six monthly rotating Calman registrars who do not spot the hidden agendas but do measure and plot the height and weight accurately? Is it more important to see a paediatric dietitian or have the urinary microalbumin performed and retinal examination recorded? We must clearly all strive for achievement of the best possible service for these children and undoubtedly the current recommendations represent best possible. Life must remain liveable however for the children, their families, and the service providers. Rationalisation of care so that one paediatrician has responsibility for diabetes care in each district general hospital (and in many teaching hospitals) would go a long way to provide the minimum experience advisable. The teams need to have specialist nurses, dietitians, and psychologists with special and specific experience in working with diabetes in children. This audit shows the need for increase in the numbers of these personnel who probably have a much greater impact on management success than the paediatrician. For disease management to be at its best caseload must be large enough to provide adequate experience but small enough to allow time for care, support, and education. The lack of expected correlations of the clinical markers studied with diabetes specialist nurse input may be due to the fact that many of the nurses in this study had caseloads in excess of 150 per whole time equivalent (WTE). This masks the fact however that in at least one clinic there is a diabetes specialist nurse allocated 0.1 WTE to look after 20 children (a caseload of 200 per WTE) thus suffering the ‘double whammy’ of a workload that is too high combined with an experience that is too low. Like most things in life optimums often lie somewhere around the centre of a continuum. Although this paper suggests that tertiary specialists achieve a glycated haemoglobin some 8.0% lower than non-specialists, this is expressed as a percentage of a multiple of the mean reference range and represents a difference of only around 1.0% of measured glycated haemoglobin. The difference between tertiary and district general hospital specialists was therefore only around 0.5% in an assay with a coefficient of variation in most laboratories of not better than 5.0%. The district general hospital specialists however, fared rather better in terms of clinic attendance rates, readmission rates, and provision of a dietitian. The authors, however, need not be defensive of their position. The case is well made for a specialist team approach. Paediatricians must clearly cooperate with each other to form teams and clinics of suitable size and where geography dictates that this is impossible some form of shared care arrangements should be made.